The ones I find come with a 400Hz VFD and plug into 220V but they don't state what the required input power is. I'll have to email them when I get the money together. That's probably overkill unless you have a very poor grade power coming. As you can see the shipping is more than the item. Look around locally and you may find that even a larger transformer saves you money over shipping in a smaller one. A larger transformer can also handle several motors at once if you can deliver enough watts. Another test piece, some more z-axis steps missed... evidently I need to really cut down the acceleration on my z-axis and maybe add some shielded cable to that motor. It has very distinct places where I'm running my finishing cuts that the z-axis moves a bit lower then on the previous cut path. I wonder if that axis needs a bit stronger motor. I"m hoping that it improves as the lead nut loosens on the screw just a bit. Eric Baack wrote: Another test piece, some more z-axis steps missed... evidently I need to really cut down the acceleration on my z-axis and maybe add some shielded cable to that motor. It has very distinct places where I'm running my finishing cuts that the z-axis moves a bit lower then on the previous cut path. I wonder if that axis needs a bit stronger motor. I"m hoping that it improves as the lead nut loosens on the screw just a bit. I would vote for the stronger motor. I had the same problem. I broke one of my X axis motors and borrowed the big one from the Z axis temporarily and replaced it with a smaller motor and was slipping steps. Remember, the Z axis has to lift the carriage and router motor so it needs more oomph. my carriage isn't all that heavy but I'm looking at some other steppers I have. I will have to rebuild some brackets to do it. 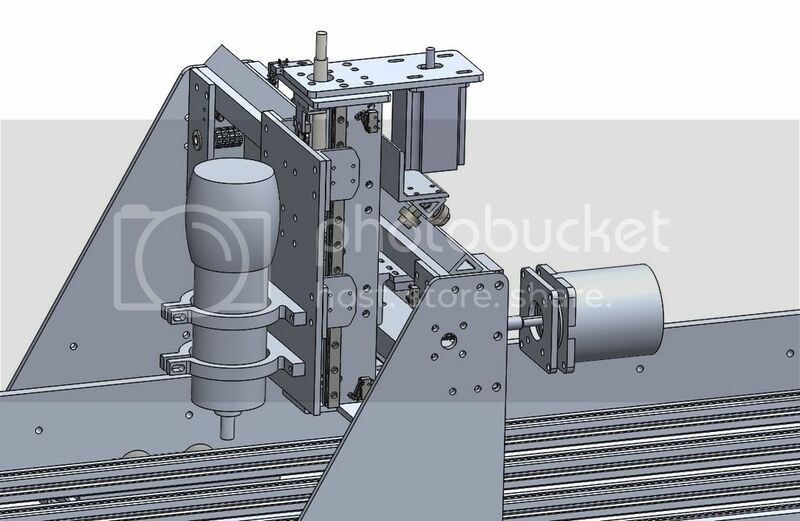 I could also throw a pulley on the lead screw and the stepper motor and give it a 2:1 speed reduction. I have room in the torque curve on the motor and would actually get into the higher torque section of the curve in doing so. I have a short HTD 15mm wide belt with a 34 tooth and 15 tooth pulley that would work with me just adding one new plate of 3" x 1/4" aluminum. I took the motor and lead screw out and the linear rail was binding pretty badly. It took a bit of force to raise and lower the router even with no lead screw in place. So I've loosened that up and I'll try and get things to line up a bit better. I'm still going to add the pulley reduction though. It will give a bit more margin. Here's what I'm going to try. Just getting the bearings to move more freely will probably fix it, but this will add a bit of counter balance to the router and provide a bit more oomph to the Z-axis with a 34:15 pulley reduction. You could try a sash balance spring or a small gas strut. I don't think weight is an issue. The rails were binding BADLY. I think getting those to fit a bit better (may have to shim one) and adding the pulley will give me plenty of margin. The motor was right in the 230 oz-inch range of it's torque curve and the z-axis sled is only around 15 lbs with the router installed. so it moves smoothly with 3 of the bearings attached. The bracket for the 4th one has a bit of a bend to it. I'll try and straighten it out and see how it works then. I'm running a shielded cable for the z-axis now as well. The screw turns easily by hand now. It did not before. Got the bracket back on after using my precision adjustment tool (hammer) and it runs nice and smooth still I have another chunk of pine glued up to test it out. It was working much better, though I will have to do some work on the neck joint design I think. It was much thinner then I anticipated. I need to measure and compare it to the model. then probably beef up the joint in the model. Your videos are private so we can't watch them. CNC is going to start a remodel before too long. I did get rid of the belts on the X axis and went with a pair of 1/2-10 5 start lead screws with a pair of nema 34 steppers running them, one being a slaved axis on the controller. The X motion runs great now. I had an issue with the belt drive on the X axis where my belts were walking over the flange of the pulley and getting all mangled up. So now that axis is smooth. I have a new set of actual linear bearings to replace my skate bearings. Once I have a bit more funds I'll replace my Y axis as well with some proper linear bearings and a lead screw. The side plates are going to change from 1/4" to 1/2" thick aluminum and I have welded up a steel gantry from 2" x 2" x 1/8" steel angle. It should stiffen the whole thing up significantly and get rid of the galling on my aluminum rails with the skate bearings.